Copyright: © 2018 Palaniappan V. This is an open-access article distributed under the terms of the Creative Commons Attribution License, which permits unrestricted use, distribution, and reproduction in any medium, provided the original author and source are credited. This paper introduces and develops a nonlinear theory that extends the linear Prandtl Lifting Line theory. Lifting Line theory works well for wings with large aspect ratios, but fails for wings with small aspect ratios. In the context of Micro Aerial Vehicles (MAVs), the size constraints impose a need for wings and control surfaces with small aspect ratios. Hence, a nonlinear theory is introduced in this paper. The theory uses a system of vortices with variable strength, and using the boundary conditions, solves for vortex strength. Using that, we are able to find the lift generated by the given surface. I extend this by considering control surfaces where the angle of attack is changed and investigate the response of lift. This response is then compared with response of general aircraft airfoils. Aerodynamics, Lifting line theory, Prandtl’s theory, Nonlinear. The intend of this paper is to develop a nonlinear theory that extends the classical Prandtl Lifting Line theory. Over the years, there has been minimal research into theoretical methods to find the aerodynamic characteristics of wings that have low aspect ratio, especially when the Prandtl theory does not provide accurate predictions. This is especially applicable to the research and development of Micro Aerial Vehicles (MAVs) due to their small size and inability to have wings with large aspect ratios [1,2]. Furthermore, when considering control surfaces on the MAVs, the aspect ratio is definitely limited to low values, to maintain size and stealth. However, it is also necessary for MAVs to have manoeuvrability to navigate urban environments and gain intelligence. 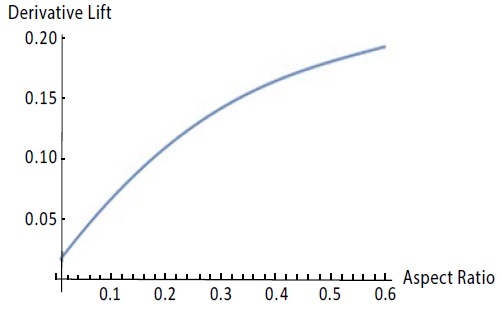 Hence, the following nonlinear theory is used for the investigation of the response of the coefficient of lift to flap deflections. I have used a similar approach to the nonlinear theory as Bollay , and have reached the same results, confirmed by the approach to Prandtl’s Lifting Line Theory  for large aspect ratios. The vortex strength across the span of the wing. The downwash is constant across the span and equal to the value at the centre of the span. Now we will find the induces velocities due to the hound vortices. As for the boundary condition, the v x 1 = γ 2 when z is slightly above zero and v x 2 =− γ 2 when z is slightly below zero. Where γ is the aspect ratio. Now we will investigate the induced velocities due to the trailing vortices. Consider the Figure 1. Figure 1: Trailing vortex geometry. Note that l1 refers to the modified Bessel Function of first order . This is an implicit equation of 𝜃 and can only be solved numerically. Clearly, this agrees with Prandtl’s Lifting Line Theory. 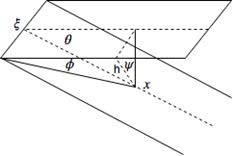 The only term that contributes to the aerodynamic derivative is C L flap . Hence, to compute the aerodynamic derivative, we need to find C ′ L flap . This was done using Mathematica, and the results are in Figure 3. CLflap ′ vs Aspect ratio. Figure 3: CLflap ′ vs Aspect ratio. Since for MAVs, we cannot effectively have a tail with elevators [9,10], due to the downwash effect and lack of size to design in a way that avoids the downwash from the wing, we are forced to use the ailerons and flaps for both lateral and longitudinal control. Hence, it is important to compare C L δ with our results. We get values for C L δ as 5.70, which is much bigger than our results for low aspect ratio wings . It can be inferred that due to this, the deflections required by the low aspect ratio wings and control surfaces will be much greater and elicit much different control systems to implement such deflections. An issue would be the behaviour of the control surfaces at high angles of attack, but that is beyond the scope of this research. Overall, we have used the nonlinear modified version of Prandtl’s Lifting Line Theory to derive the lift coefficient of low aspect ratio wings. The results concur with classical lifting line theory for high aspect ratios. Furthermore, this method is useful in designing control surfaces such as flaps for MAVs due to their size restriction .